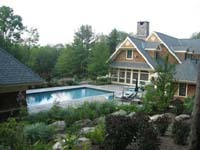 Intensively planted perennial gardens anchor the stone-and-shingle country lodge on its mountaintop site. The graceful drive curves through mature woodlands as it climbs a half mile to the building site. Parking court is tucked into a naturalized garden, introducing the rich woodland upon arrival. 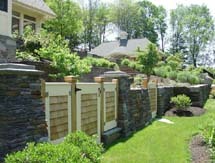 The complementary contrast between the manicured lawn and naturalized hillside is echoed by the juxtaposition of rough boulders and the curving Ashfield stone wall. High in the wooded Berkshire hills, the clients purchased a 45-acre property on which they planned to build a 10,000 square foot stone-and-shingle country lodge. Generous entertainers, they wanted pavilions, terraces and gardens to complement the residence, guest house, pool, cabaña, pool house, and two three-car garages. 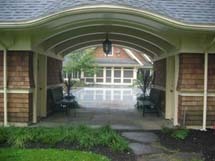 WCA played an integral role in this project from start to finish, working collaboratively with architect, engineer, landscape contractors and clients throughout the multi-year design and implementation. Working with principal architect Michael Gorman, WCA adjusted the site plan to better accommodate the demanding program on four intensively designed acres. Because the property falls within the town’s Scenic Mountain Zone, every effort was made to screen the house and minimize site impact by protecting existing trees and preventing erosion of the soils. 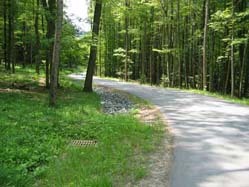 WCA collaborated with Foresight Engineering to design a half-mile driveway that gracefully climbs a 20% slope and arrives at a mid-level parking court surrounded by stone work and native plants. 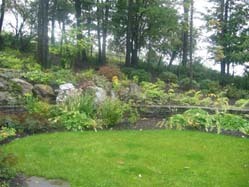 Huge boulders stabilize cut embankments, creating extensive and naturalized rock gardens. Multiple springs challenged the design at every step, and required sensitive yet assertive management of stormwater. 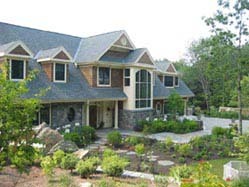 Water collected above the house was channeled into a featured drainage swale; groundwater was only minimally piped, allowing it to reinfiltrate as soon as possible. Weirs behind the stone embankments prevent outwash and erosion. 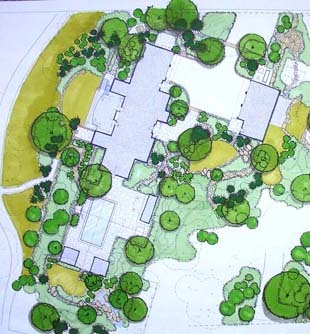 WCA prepared visual studies for the permitting authorities, showing how the site plan would meet the town’s stringent regulations to screen views of the house, as well as numerous studies for the clients to help them visualize design alternatives for retaining walls and fencing, pool area, terraces, gardens and recirculating waterfall. Now in its fourth year of construction, WCA continues to design native gardens, woodland trails, and an overflow parking meadow with entry gate for occasional large gatherings. The geometric alignment of the home contrasts with the organic character of the landscape, and is oriented toward a distant southwest view. A secret garden lies beyond the pool terrace, revealing a constructed waterfall with boulders brought onto the site. A series of stone walls, climb the sloping site, and help to scale the large building. Looking back toward the house, the cabaña frames the pool and southwest wall of the home.